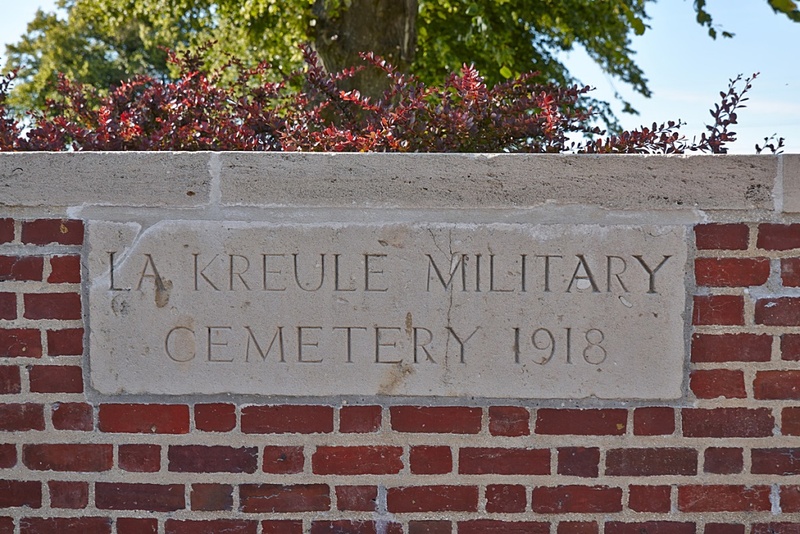 La Kreule is a small hamlet 2 kilometres north of Hazebrouck, on the road to St Sylvestre-Cappel and Steenvoorde. 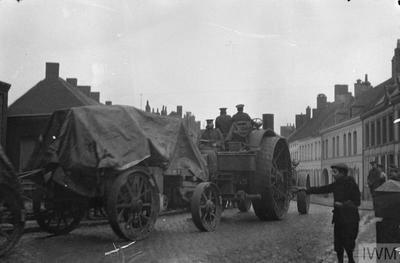 Leave Hazebrouck on the D916 heading north. 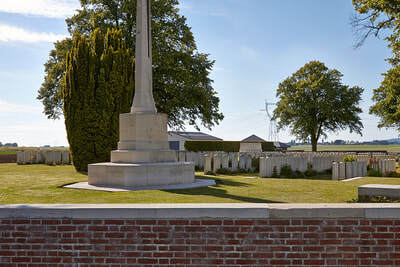 The Cemetery is visible from the roundabout where the D916 crosses the Hazebrouck by-pass. 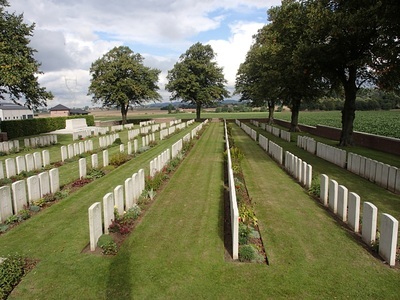 The access road to the cemetery is 100 metres off the roundabout, on the left hand side. La Kreule Military Cemetery was opened in April 1918 by the 1st and 2nd Australian Casualty Clearing Stations, which came back from Outtersteene ahead of the German advance, and the 17th, which arrived from Lijssenthoek. These three stations, known collectively as "Ana Jana Siding", were posted to the north of La Kreule, but in the middle of April they withdrew to Blendecques, near St. Omer, and the cemetery was then used by heavy artillery and fighting units. 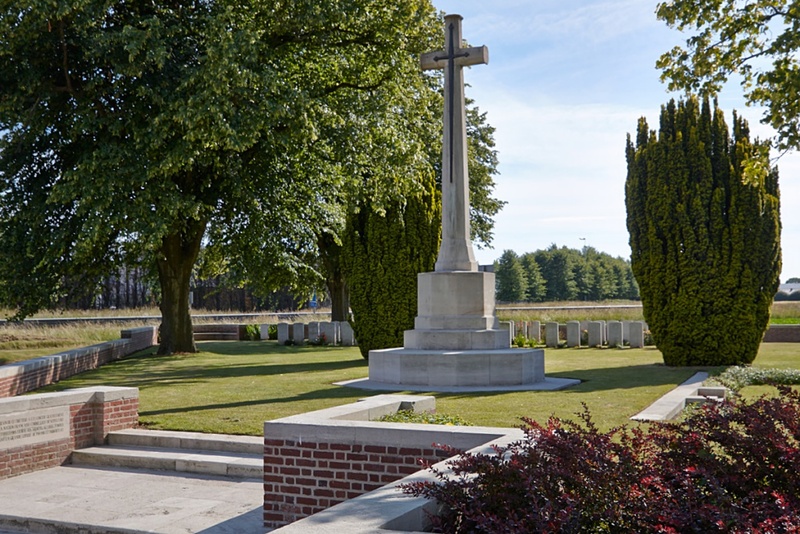 In October 1918, the 17th Casualty Clearing Station returned with the 8th and the 64th and the cemetery was closed at the end of the month. 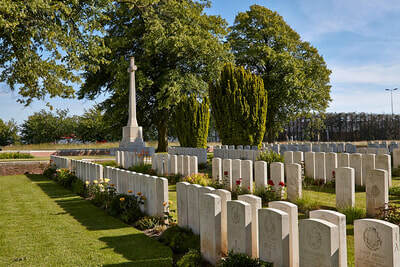 The cemetery contains 576 Commonwealth burials of the First World War and 11 German war graves. 19th September 1918, aged 23. Eldest son of Thomas and Fanny Bullock, of Burnley, Lancs. ​His headstone bears the inscription; "A Loving Son And Brother." Robinson Bullock was born in Burnley in August 1895, he was the son of Thomas, a Stonemason and Bricklayer and Fanny Bullock. At the time of his birth the family were living at Hart Street, Burnley. By 1901 Robinson - or Robin as he was known - was joined by a brother Heber, they remained resident at Hart Street and he started his education at St Peter's DaySchool before joining the Higher Grade School as a scholarship winner. By 1911 the family had moved to 7 Lebanon Street in the Fulledge area of the town and Robinson and Heber had been joined by two other brothers, Neville and Edgar and a sister Frances. Robinson, now sixteen, was at this time working as a clerk for the Poor Law Union. 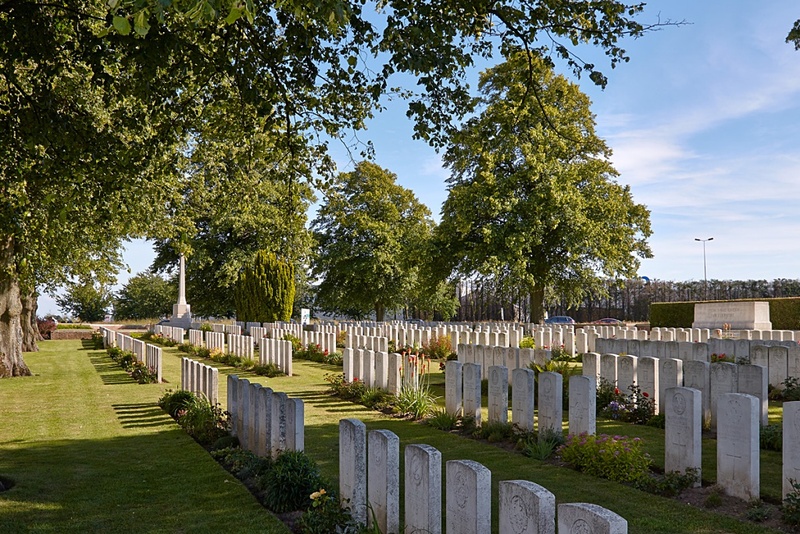 He was a talented writer, as a boy being a frequent contributor to and winner in the local newspaper's children's column, he was also a member of the Territorial Artillery and well known within the Parish Church. He first saw active service in Egypt where he arrived in September 1914, he was wounded at Gallipoli and saw further service in Palestine and France where he was wounded and gassed. 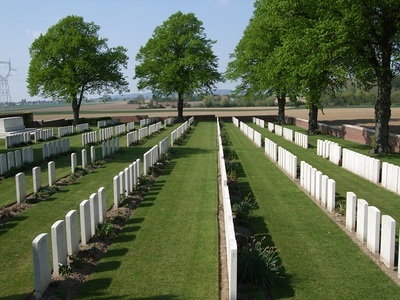 By the time of his death in 1918 he had seen almost exactly four years active service, his parents, who by now had moved to Great Crosby were informed that their son had been wounded on 18th September 1918 and died of his wounds the following day at a Casualty Clearing Station where he was later buried. 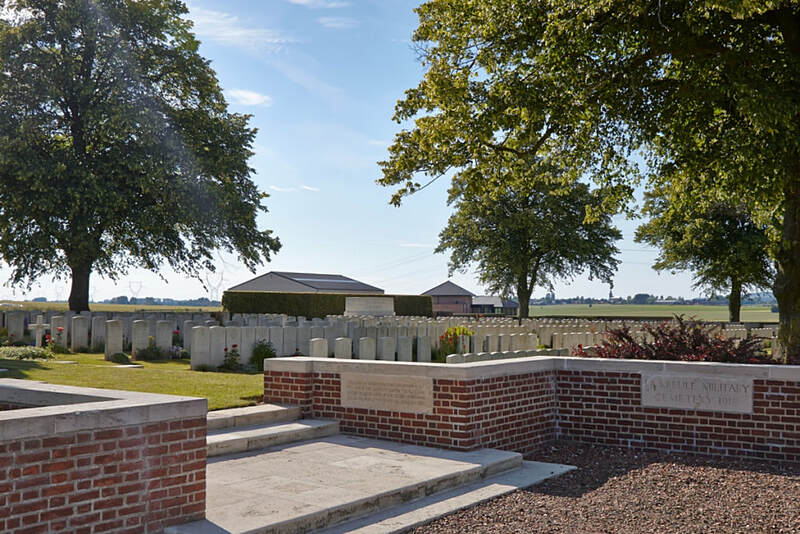 Robinson Bullock's grave can now be found in La Kreule British Cemetery near Hazebrouck, France where his headstone is engraved with "A Loving Son and Brother." 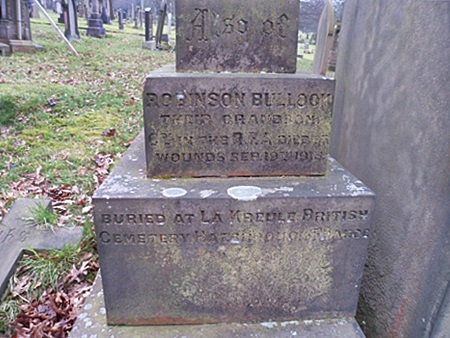 He is also commemorated on the grave within Burnley Cemetery of Eastwood and Fanny Robinson, his grandparents, the inscription reads "Also of Robinson Bullock, their grandson, Cpl. in the R. F. A. (TF). Died of Wounds Sept. 19th 1918. Buried at La Kreule British Cemetery, Hazebrouck, France. Robinson Bullock, remembered on his grandparents' headstone. Allan Parish Edwards, M. M.
From Macleay River, NSW. 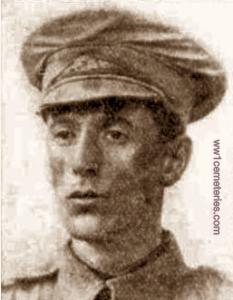 Pte Edwards was awarded the Military Medal on 14 December 1917; "For conspicuous bravery and devotion to duty during operations east of Ypres from 29th Sept. to 5th Oct. 1917." Allan Edwards was killed whilst acting as a Stretcher Bearer, he was sniped in the back and died instantly while going into the line at Meteren. His body was brought back and buried at La Kreule. 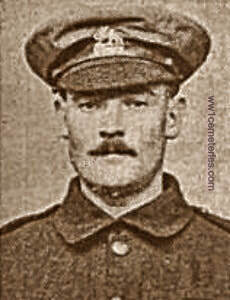 Robert Giles was wounded in a newly captured German trench as he and his men were 'digging in'. 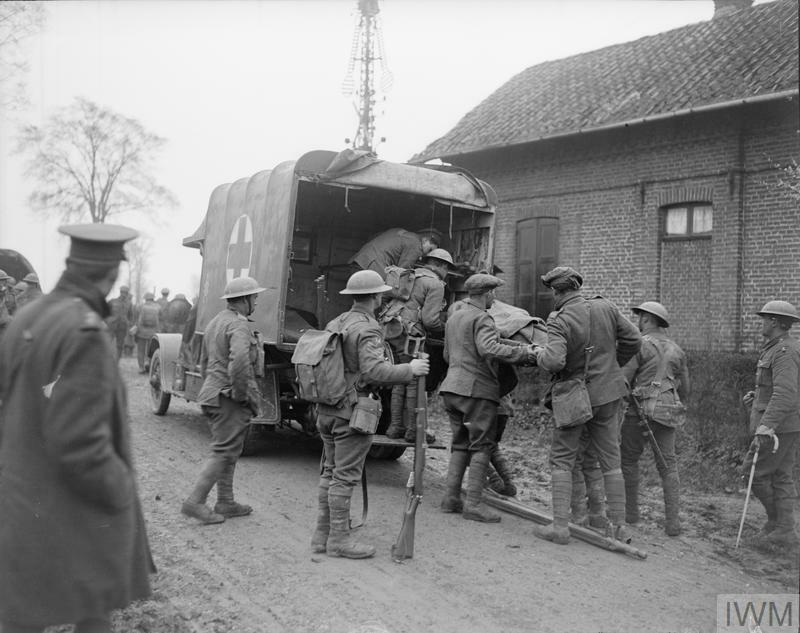 He initially told his men that he had a "nice one for blighty," as he had only a slight wound. He was later seen to be badly hit in a shell hole and although still alive he died soon afterwards. 1st Bn. Australian Infantry, A. I. F.
30th May 1918, aged 42. Born at Liverpool, England. Son of Thomas and Elizabeth Horsman, husband of Alice Horsman, of 22, Queen St, Preston, Lancs. His headstone bears the inscription; "In Loving Memory Of My Dear Beloved Husband." From Sydney, NSW. A hotel porter prior to enlisting, he embarked from Sydney aboard HMAT Ceramic (A40) on 7 October 1916. An officer's batman, he was killed in action, aged 39, when a shell exploded behind the lines near Hazebrouck, France on 30 May 1918. 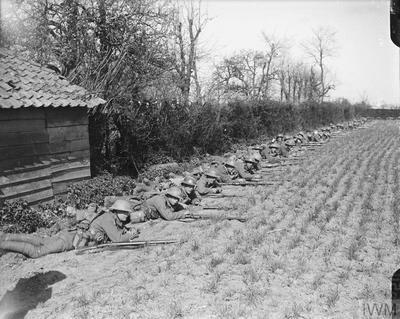 Private Horsman, a Batman in "B" Coy., and Smith, an officers' cook had just gone into the cook house whilst in reserve at about tea time, when a long range shell landed on the building and killed them both instantly. 5th June 1918, aged 38. Son of Henry and Caroline Inglis; husband of Florence May Inglis, of The Nest, Wollongong Road, Arncliffe, Sydney. Native of Naracoat, South Australia. ​His headstone bears the inscription; "I Have Fought The Good Fight. 2ND TIM.4,CH. 7TH.VER." 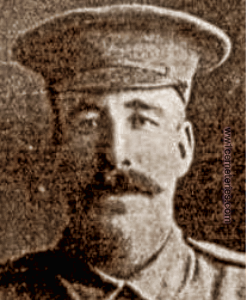 A Salvation Army Officer from Ararat, Victoria when he enlisted in the AIF on 8 June 1916. 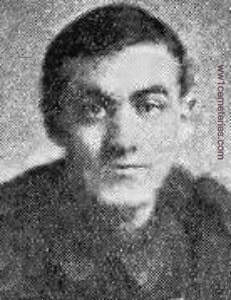 He embarked for overseas with the 20th Reinforcements from Melbourne on 11 September 1916 aboard HMAT Euripides. While serving on the Western Front, Pte Inglis was killed in action on 5 June 1918. 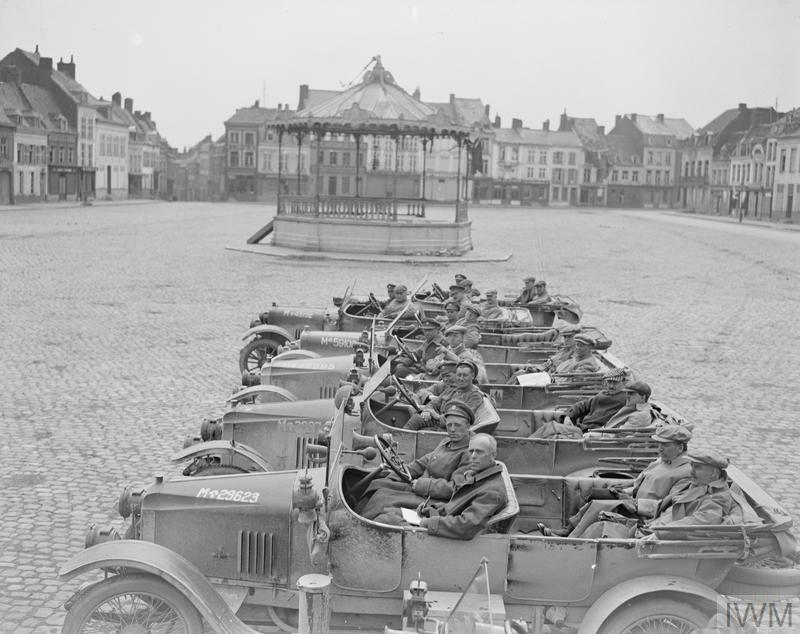 11th September 1918, aged 30. Son of Mary Jenkins, of 4, Mary Street, Twynyrodyn, Merthyr Tydfil. His headstone bears the following inscription; "Gone But Not Forgotten." 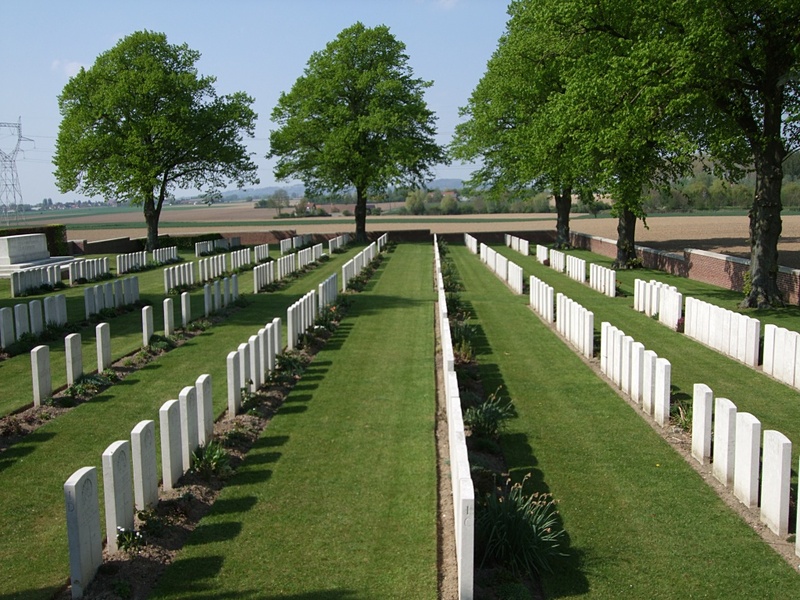 6th September 1918, aged 20. Son of George and Ellen Jane Lesson, of Horwich, Lancs. His headstone bears the following inscription; "We Cannot Lord Thy Purpose See But All Is Well That's Done By Thee." 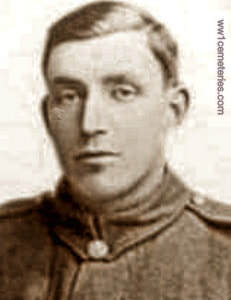 Fred, as he was known, of 41 Webb Street, Horwich near Bolton in Lancashire, joined the County Palatine Royal Field Artillery 191 Brigade. At the time of his recruitment on 19th May 1915 he lied about his age saying that he was 19 years old when he was only barely 16. 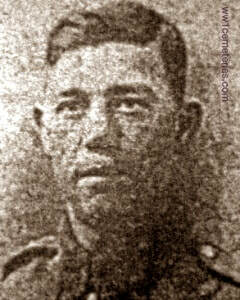 Fred was the only son of George and Ellen Jane (Nellie) Lesson He died on the 6th September 1918. 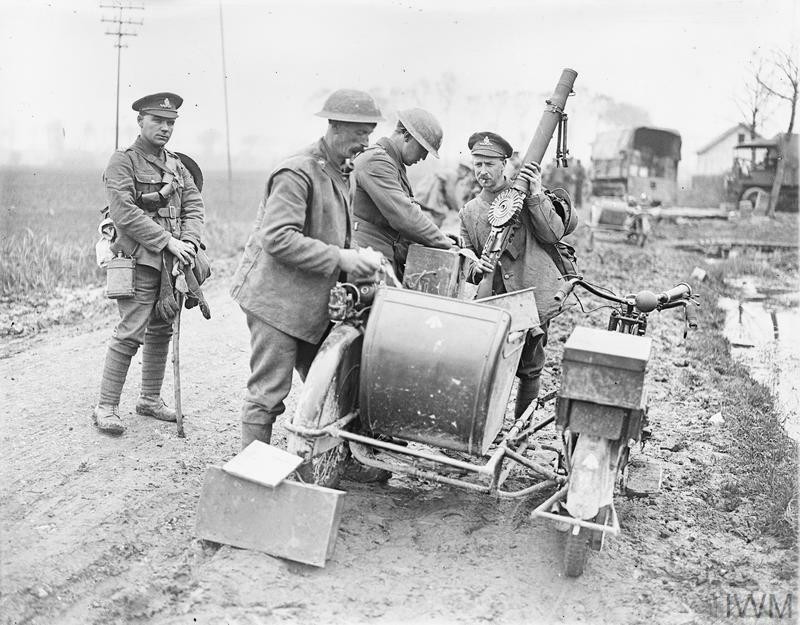 He was conveying some men ,who were going home to England on leave, away from The Front when they were hit directly by a shell from a long range gun. He was just 20 years old. 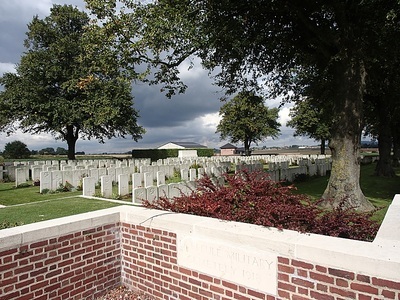 If anyone has any information about the activity of the RFA in this region on the day he died 6th September 1918, I would be very grateful for it. 1st October 1918, aged 21. Son of Fred and Martha A. Manners, of Ossett, Yorks. ​His headstone bears the inscription; "Though Death Divides Still Memories Cling Faithful Unto Death." 19th September 1918, aged 21. Son of Joseph and Elizabeth McCracken, of Castledawson, Co. Londonderry. His headstone bears the inscription; "There Shall Be No More Death." From Armidale, NSW. He has inscribed the photograph, "Always smiling! Love from Charles McDonald 25th Aug 1917". 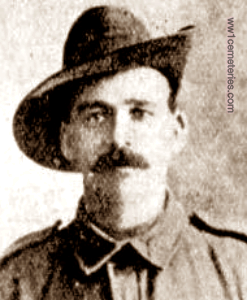 A bank clerk prior to enlistment on 1 June 1916, Dvr McDonald embarked from Sydney on 30 September 1916 on HMAT Aeneas. 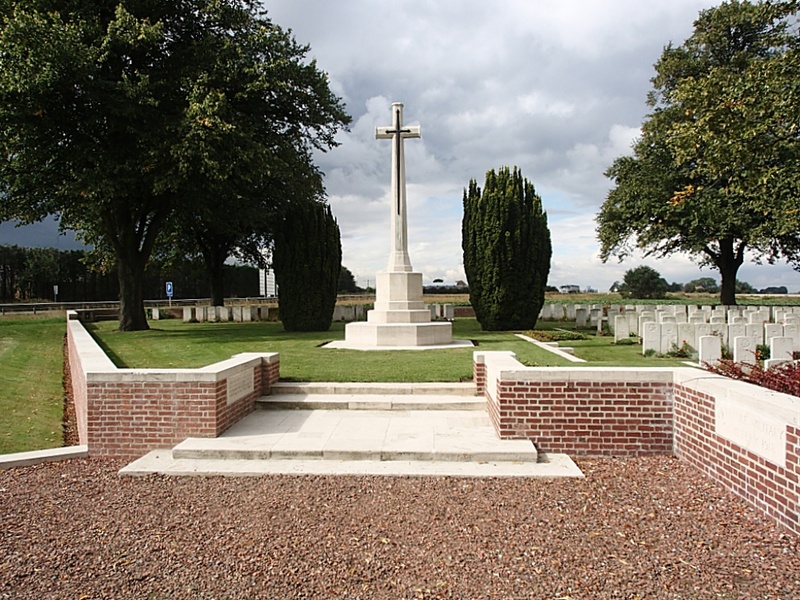 He was killed in action in France on 30 July 1918 while serving with the 1st Divisional Ammunition Column. Son of Mrs. E. McGregor, of 'Cairn Dhu,' Matheson Road, Stornoway. ​His headstone bears the inscription; "Be Thou Faithful Unto Death REV. 2.10." 28th June 1918, aged 20. Son of John McDonald Oswald and Helen Oswald, of Sea View Road, Grange, South Australia. Native of Adelaide, South Australia. His headstone bears the inscription; "He Laid Down His Life For Others No Man Could Do More." A journalist prior to enlisting in August 1917, Pte Oswald embarked from Melbourne with the 25th Reinforcements on board HMAT Aeneas (A60) on 30 October 1917. He was killed in action at Merris, France, on 28 June 1918. Son of Mr. C. A. and Mrs. E. Pade. Native of Hahndorf, South Australia. ​10th Bn. 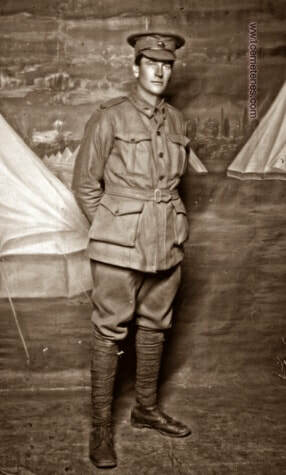 Australian Infantry, A. I. F.
Cleve James Scott, M. C.
22nd July 1918, aged 22. Son of James and Felicia R. Scott, of "Frankcleve," Church Hill, Gawler, South Australia. His headstone bears the inscription; "And In Memory Of Lieutenant F.J. Scott Killed In Action 8. 10 .17 Sons Of J. & F. Scott, Gawler." (Refers to Lieutenant Frank John Scott, also 10th Bn. A. I. F., Killed in Action 8th October 1917, aged 23 and commemorated on the Menin Gate Memorial.) Also note the name of Mr & Mrs Scott's house in Gawler, "Frankcleve," incorporates the names of both sons who lost their lives. "It was at Merris on the night of 22nd July. He had gone out with a party to take a machine gun post and was hit in the head by a machine gun bullet and killed instantly. 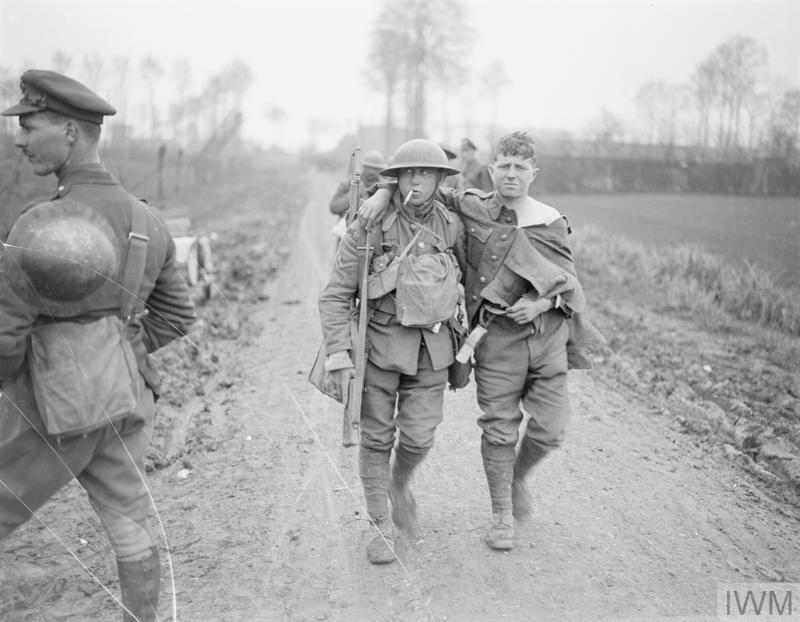 I did not see him hit but helped to carry him in from the front line to company headquarters." 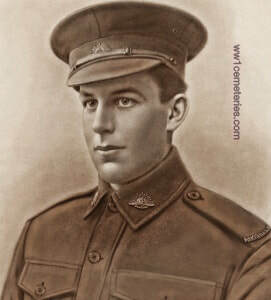 Cleve James had only just returned to his battalion having recently recovered from a serious gun shot wound to the thigh in June 1918. From Lidcombe, NSW. A labourer prior to enlisting, he embarked from Sydney aboard HMAT Medic (A7) on 30 December 1915. He was wounded in action on 24 June 1918, during a raid at Strazeele, France and died soon after en route to the dressing station, aged 24. "It was in the raid to capture a post, my platoon (10) went to support. Smith had both legs taken off to thighs by shell. he lived about an hour, I saw him die at the Dressing Station, he was conscious to the last. His body was taken back and buried behind Hazebrouck. 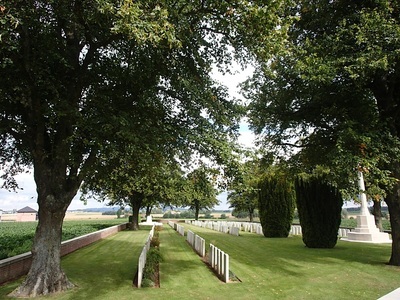 The raid in which he was killed was at a point between Merris and Meteren"
20th September 1918, aged 26. Son of Francis and Catherine Staines, of North Court Cottage, Finchampstead, Berks. ​His headstone bears the inscription; "Thy Will Be Done God Giveth His Beloved Sleep." Stuart Campbell Taylor, D. S. O. General Staff, 93rd Inf. Bde. 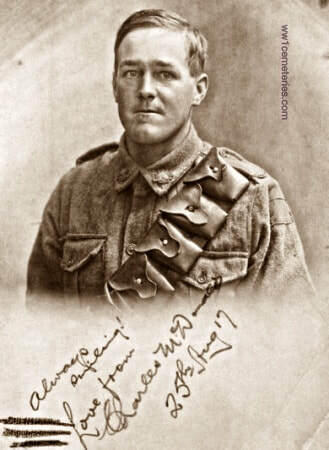 11th October 1918, aged 45. Son of James and Eliza Anne Taylor, of Oxford. 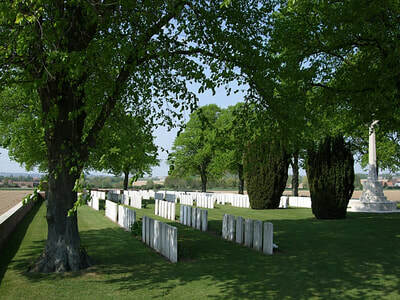 30th May 1918, aged 23. Son of W. J. and E. Williams, of 55, Second Avenue, St. Peter's, South Australia. Native of Blinman, South Australia. 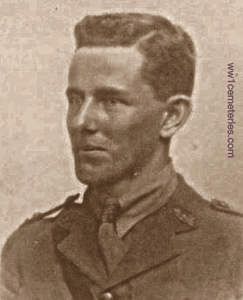 A moulder of Richmond, SA, prior to enlistment, he embarked on HMAT Plymouth (A9). He was killed in action 30 May 1918. His headstone bears the inscription; "Beloved Youngest Son Of W. & E. Williams Aged 17." 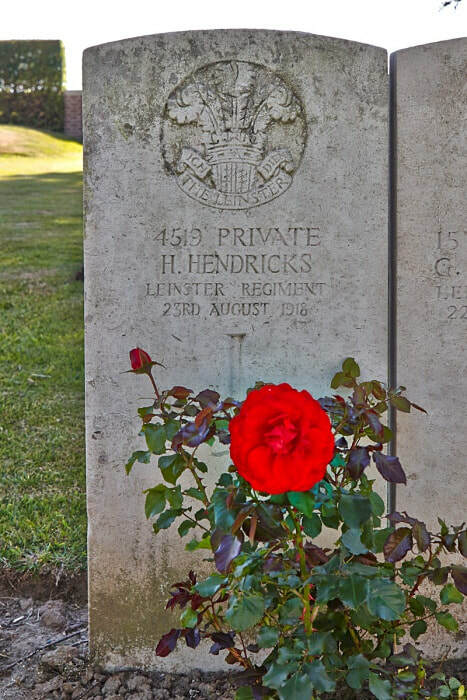 4519 Private, Harry Hendricks, 2nd Bn. 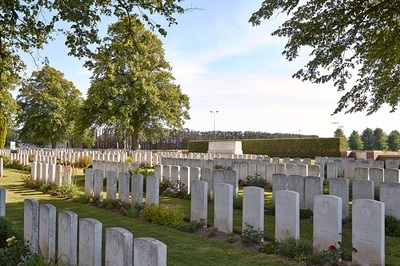 Leinster Regiment, executed for desertion 23rd August 1918, aged 46. Plot III. 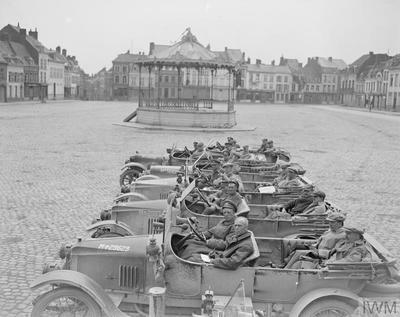 C. 1.